Magic forward Rashard Lewis will be on hand this Saturday to celebrate the grand opening of Orlando's very first House of Hoops location. Just last week, House of Hoops by Foot Locker opened the doors to it's 15th location in Miami's Dadeland Mall. This weekend, the House of Hoops team will head north to Orlando to celebrate yet another grand opening. 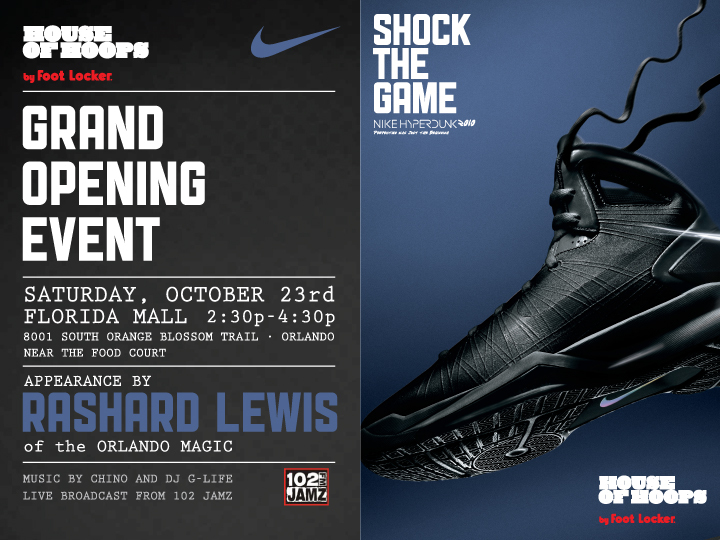 Opening in the Florida Mall's existing Foot Locker location, Magic forward Rashard Lewis will be on hand to celebrate the grand opening. No special releases are set for the big opening, however you know when a HoH opens, something special is bound to release. Who knows, maybe more of the "South Beach" LeBron 8 or even the "Olympic" Air More Uptempo that released unexpectedly at the Miami location. Either way, this is something Orlando sneaker collectors and basketball fans will not want to miss. If you're in the Orlando area, make sure to head out to the Florida Mall this Saturday, October 23rd for the grand opening of Orlando's first House of Hoops location.